Image © The Chancellor George Osborne, Communities Secretary Eric Pickes and Planning Minister Greg Clark have all been defending the government's new National Planning Policy Framework, on the grounds that it will enable the construction of more homes, as well as encourage economic growth. Some in the housing sector have praised the NPPF, on the grounds that increasing the supply of land is the simplest way to lower the cost of housing and reduce homelessness (The UK has some of the worst housing conditions in Western Europe, with the number of homeless households having risen by 17% over the past year). However, there have also been environmental concerns, with the National Trust, English Heritage and the Campaign for the Protection of Rural England all claiming that the new framework threatens the countryside. There are also predictions that the framework's removal of the 'town centre first' principle from new office developments will generate more traffic congestion on the motorways. 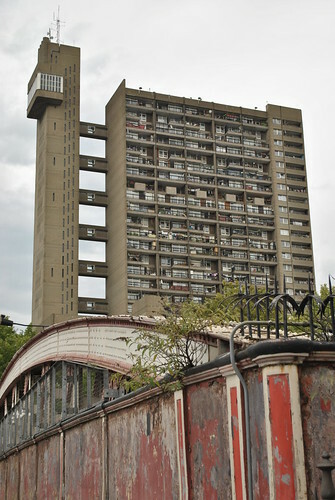 [caption id="" align="alignright" width="334" caption="Trellick Tower, North Kensington, London. Could we see developments like this in the countryside? Image from J@ck! 's photostream"] [/caption] Supporters of the new rules argue that the desperate need for affordable housing trumps any environmental concerns. But even if the environmental worries could be set aside, there is still the issue of democratic control (or the lack of it) over planning applications: if local authorities consider any new developments to be inappropriate, it will be virtually impossible for them to object. The government claims that local people will instead be able to voice objections through the new neighbourhood plans, but a recent poll found that 70% of people said that they were ‘not very likely’ or ‘not at all likely’ to get involved in these. This means that it will be easy for developers to get their planning applications accepted, whether or not their developments actually meet the needs of local people. Property companies have given a total of £3.3 million to the Conservative Party over the past three years, which is likely to raise suspicions that the new planning rules have been deliberately rigged to favour the interests of developers. The existing planning system has clearly been inadequate in providing affordable housing, but if the new system is not designed to serve the interests of ordinary people, it could also turn out to be a failure. Relaxing the planning laws – a solution to the housing crisis? The Chancellor George Osborne, Communities Secretary Eric Pickes and Planning Minister Greg Clark have all been defending the government’s new National Planning Policy Framework, on the grounds that it will enable the construction of more homes, as well as encourage economic growth. Some in the housing sector have praised the NPPF, on the grounds that increasing the supply of land is the simplest way to lower the cost of housing and reduce homelessness (The UK has some of the worst housing conditions in Western Europe, with the number of homeless households having risen by 17% over the past year). However, there have also been environmental concerns, with the National Trust, English Heritage and the Campaign for the Protection of Rural England all claiming that the new framework threatens the countryside. There are also predictions that the framework’s removal of the ‘town centre first’ principle from new office developments will generate more traffic congestion on the motorways. Supporters of the new rules argue that the desperate need for affordable housing trumps any environmental concerns. But even if the environmental worries could be set aside, there is still the issue of democratic control (or the lack of it) over planning applications: if local authorities consider any new developments to be inappropriate, it will be virtually impossible for them to object. The government claims that local people will instead be able to voice objections through the new neighbourhood plans, but a recent poll found that 70% of people said that they were ‘not very likely’ or ‘not at all likely’ to get involved in these. This means that it will be easy for developers to get their planning applications accepted, whether or not their developments actually meet the needs of local people. Property companies have given a total of £3.3 million to the Conservative Party over the past three years, which is likely to raise suspicions that the new planning rules have been deliberately rigged to favour the interests of developers. The existing planning system has clearly been inadequate in providing affordable housing, but if the new system is not designed to serve the interests of ordinary people, it could also turn out to be a failure.